As you know from Monday’s review, I recently returned from Ontario, Canada and of course sampled cupcakes from different bakeries while I was there. While I did not research cupcakeries in Toronto very thoroughly, I did plenty of research on cupcake shops in an area called Hamilton, located about 20 minutes from our Cottage by the Lake. I had already narrowed my options down to about four shops, when I saw “The great cupcake taste test” from the Hamilton Spectator. Knowing that I wasn’t going to be able to visit all four, I was beyond happy to have this guide to go by and decided on my final two choices: Cupcakes of Westdale Village (voted best Chocolate/Chocolate) and Beyond the Batter Cupcakes (voted best Vanilla/Vanilla). Normally, I don’t tend to purchase the classic flavors. You could say I’m a risk taker when it comes to cupcakes. But, since they were voted the best in each category I knew I had to get each of these flavors. I decided that I would also get a fun flavor of my choice when I was there, just to keep things interesting. 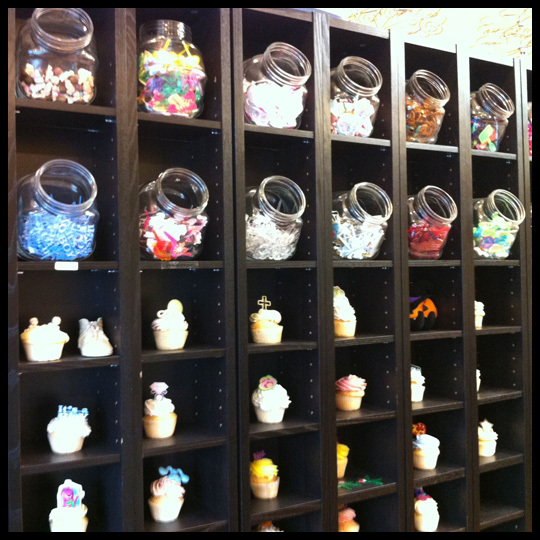 In part one of this review, I will share my visit to Cupcakes of Westdale Village. On our last morning in Ontario, I headed out while the hubby stayed in with our puppy. 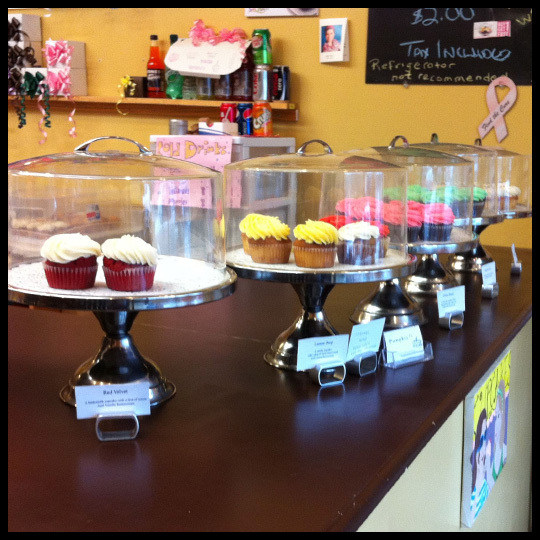 My first stop was Cupcakes of Westdale Village. As you can see, the outside of the shop isn’t really fancy or anything, but the bold use of “Cupcakes” caught my immediate attention, which is great when you are in a totally unfamiliar area. 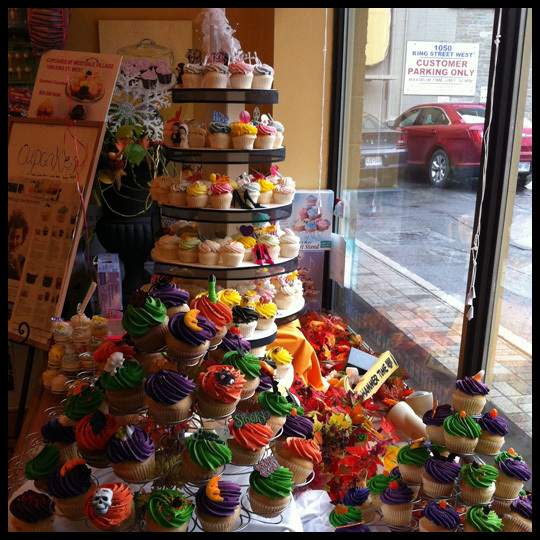 When I walked in, I was a little surprised to see Halloween cupcakes still displayed in their front window. I guess since they celebrate their Thanksgiving before we celebrate ours, there was no rush to update the display until it gets closer to winter and holiday festivities? I’ve never seen anything like this before, and have to admit I was quite impressed. I think more cupcake shops should do this. When most people are purchasing cupcakes, they are for a special event, and with the options at Cupcakes of Westdale Village you can make your cupcake feel custom without spending a ton of money. They get major points in my book for this wall of fun. A woman in front of me was ordering 2 dozen cupcakes, so already knowing I was getting the Chocolate/Chocolate, I browsed their other options and debated on what I would get. Their displays were simple dessert stands with descriptions below of what the flavors inside were. At first glance, it appeared that they were running a bit low on cupcakes, so I was worried they wouldn’t have many left after the customer in front of me was done, but then I noticed that they had containers full of cupcakes behind the counter. 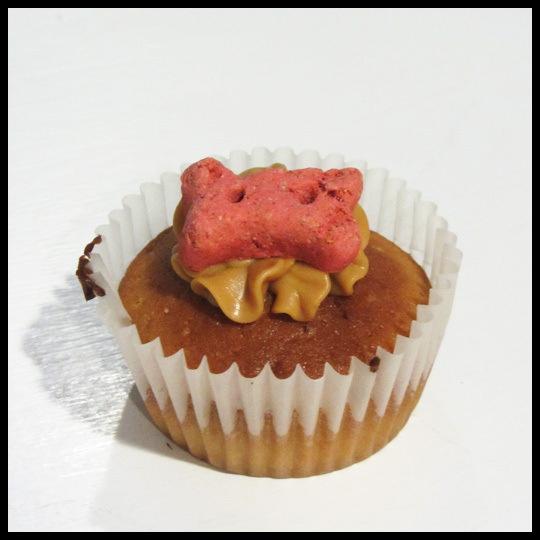 While I was walking around the little shop, I spotted PuppyCakes! Since I hadn’t gotten a puppycake for my little Puppy Face the last time I saw them offered when I visited Fancy Cakes by Leslie, I knew I was going to get one and take it back to the cottage for her. I think that more cupcakeries should offer these treats for “man’s best friend.” Maybe it’s just the dog-lover in me, but from now on, I’ll probably always get one for her when I see them. At first she was a bit confused by it, but once she realized that she could eat it, she seemed to love the fancy peanut butter flavored doggy cupcake. Okay, back to cupcakes for humans. 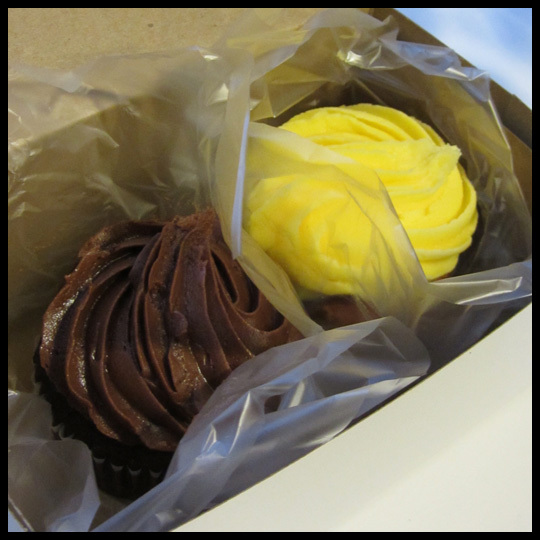 I decided on getting the Luscious Lemon in addition to my Chocolate/Chocolate. If you are familiar with my thoughts on packaging, then you know that I’m not a fan of my cupcakes being wrapped in parchment paper, or even this plastic. It always ends up messing up the frosting, and while that doesn’t take away from the flavor, it’s disappointing to have a once beautiful cupcake with smooshed frosting. 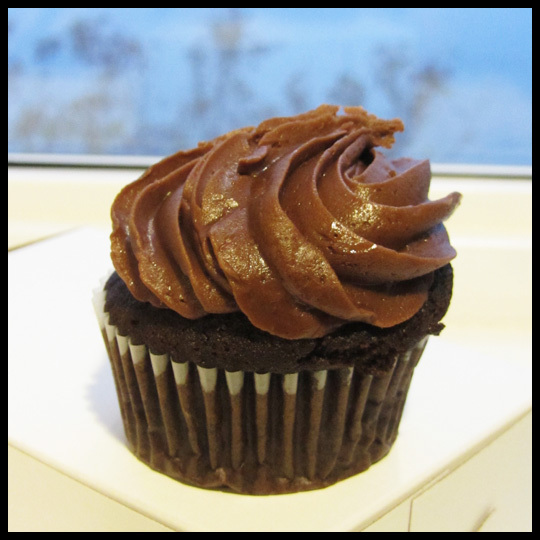 When I got back to the cottage I couldn’t wait to dive into the “best chocolate/chocolate cupcake in Hamilton, Ontario.” Knowing my hubby is a big fan of chocolate/chocolate, I willingly shared half with him. I thought this cupcake really was amazing. The chocolate cake was moist, rich, and full of chocolate flavor. It was topped with a good proportion of rich, creamy chocolate frosting. My hubby thought that the chocolate frosting from Prairie Girl Bakery that we had tried just a couple days before was better and said that their frosting and this cake would have made the perfect chocolate/chocolate cupcake. I liked both and would be perfectly fine with that combination if ever offered it. This cupcake was love at first bite. 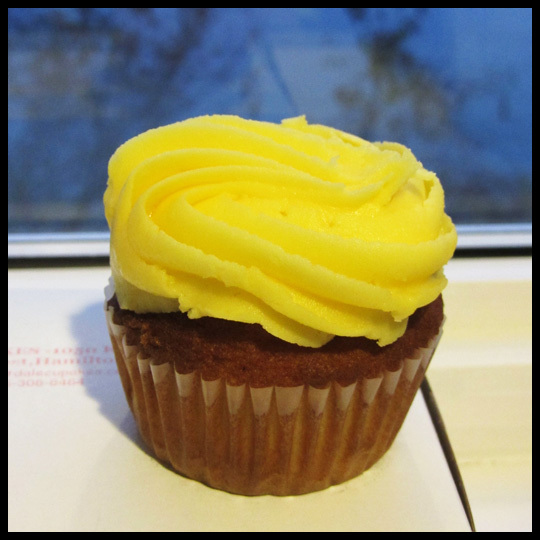 When I read the description, I wasn’t sure if the cake should have some lemon flavor included, but the lemon from the frosting and the filling was enough to make this cupcake one of the best lemon cupcakes I’ve had yet. Lemon tends to be one of my go-to flavors, and I think this was the first time I’ve ever had one with a lemon filling. And it worked very well. 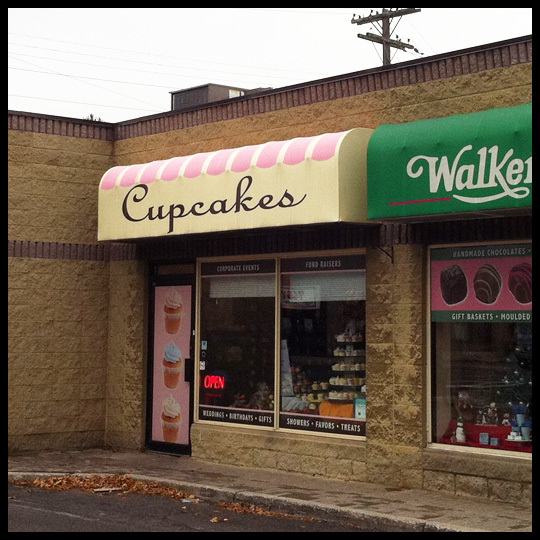 Cupcakes of Westdale Village taught me not to be fooled by outward appearances. While they might not look fancy on the outside, with their simple “Cupcake” banner and understated swirl of frosting, they’ve put all their energy into creating some amazingly delicious cupcakes that will make anyone go back for more. This entry was posted in Canada, Cupcakes, Ontario and tagged Cupcake, Cupcakes of Westdale Village, Ontario, Tour by Stacy. Bookmark the permalink. Thanks for commenting Anne! I really enjoyed our whole time in Ontario. My husband and I are hoping to return sooner rather than later. When that time comes, you can be sure I’ll be stopping in for more cupcakes. This time I think I’ll be getting more than just 2 though. It wasn’t enough! Sound’s great. In December we have our Christmas cupcakes along with our regular ones. Hope to meet you too. I’m so excited to read about the shops you visited in Hamilton since it is just across the border from me. Can’t wait to try them! Alli, you should definitely try out this place. So good!